Well hello there, friends. I haven't been around much these last couple weeks. The sewing projects have almost slowed to a halt, and I've been occupied with other projects. Other projects? What are these OTHER PROJECTS I speak of?! Well, first, I am totally overhauling my blog. I'm doing it the right way this time - test site and all. I'm really pleased with how it's coming along, and hopefully I'll be ready to push it live around the first of the year. And second, I'm working on a sewing pattern. YES, a sewing pattern! Finally! And it's going to be really awesome and different and perhaps even life-changing for some. Stay tuned. In the meantime, I know you're just dying to learn how to use the align tool in Illustrator! This tool saves me SO. MUCH. TIME. when working in Illustrator AND InDesign. It's a quick/easy way to line up objects and distribute them evenly. Yeah, I know! Now watch! Have you all been enjoying the Adobe Illustrator tutorials? I'm loving your comments on the blog and Instagram, so please, keep them coming! Next up is a quick tutorial on using the measure tool in Illustrator. With just a few clicks, you can quickly measure between objects, between line segments, whatever. This is really helpful in pattern design for obvious reasons - you can measure the length of a hemline, the width of a pattern piece, etc. 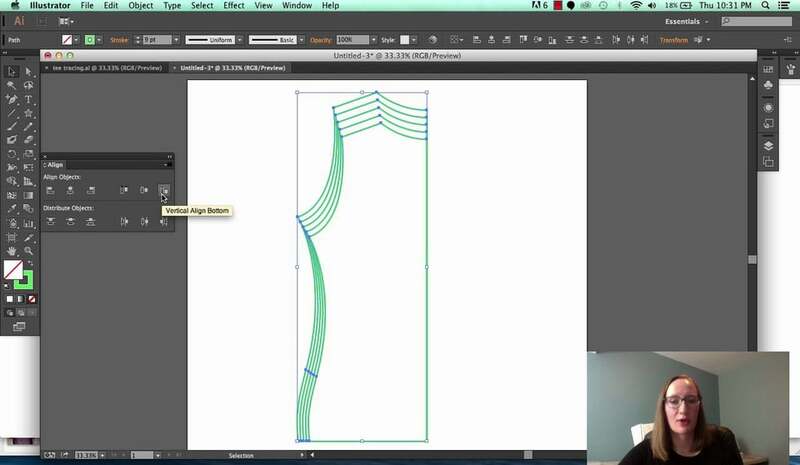 In addition to the measure tool, I show you another trick I utilize to make patternmaking easy. So, grab a cup of coffee, and enjoy! UPDATE 2/11/14: This method is only accurate on very basic shapes like rectangles and squares. I have discovered a new, very accurate method which I detail in my Pattern Workshop course. 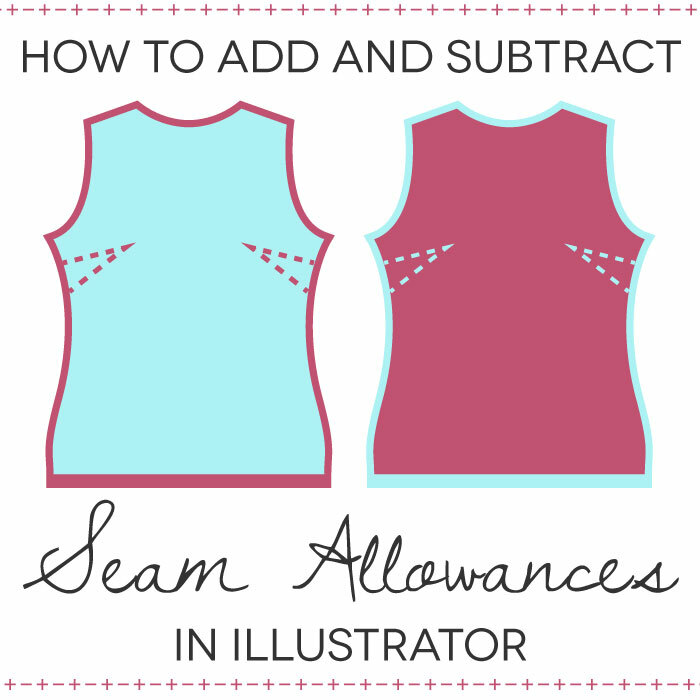 Have you ever wondered how to add or subtract a seam allowance in Illustrator? For years, I added seam allowances to my pattern pieces manually. I laugh because now I now know it's so, so easy to let Illustrator do the work of adding seam allowances for me. And now, lucky you...I'm going to show you how to do it! But first, I want to let you in on the plan for the next few weeks. I know a lot of you are really looking forward to the grading tutorial - the one where I actually show you how to take one pattern piece and grade it up and down (and all in between) to create all your pattern sizes. Patience, ladies! Hehe, just kidding. But seriously. PATIENCE! When I started writing the outline (yes, there's more to the tutorials than just turning on the camera and BAM!) for that doozie of a tutorial, I realized there were a lot of things some of you might not yet be familiar with. And if I were to try to teach you all those thing sin one tutorial, well, Vimeo would probably explode with the video upload size. Unless you already feel super confident in Illustrator, I highly encourage you to take the time to view these tutorials as we lead up to the bigger ones. They are only 5-10 minutes each, and you might learn a cool trick or two. Pinky swear! With that, let's get to adding and subtracting those seam allowances!